Investing in Lithium stocks – is it the beginning or the end of the boom? The lithium price almost doubled in 2016, making it the best performing commodity of the year. This rise triggered a boom in lithium stocks, such as Galaxy Resources, Orocobre and Neometals, which experienced annual gains of 523%, 436% and 120%, respectively. The magnitude of these gains has led many analysts to ponder whether lithium has now run its race or, like iron ore in 2004, it represents the beginning of a long and sustained upswing? To answer this question requires a robust understanding of both the demand and supply characteristics for lithium. Acorn Capital believes the investment market has a clear understanding of lithium demand but feels the understanding of lithium supply is very poor. This is aided by regular media discussions on the growing need for lithium-ion batteries in electric vehicles (EV) and power-storage units (special thanks must go to Elon Musk!). Yet ,a few analysts have compiled data to indicate where future lithium supply will come from and when this material is expected to enter the market. Although these compilations are helpful, they have tended to ignore or undervalue the potential challenges that the future operations will face during commissioning and the implications of these setbacks for the supply of lithium into key markets. A clear understanding of the potential challenges is important because they not only affect when the new lithium supply will commence and the cost of getting it into production, but also whether the final products will meet the specifications demanded by the growing sectors of the market (i.e., manufacturers of lithium-ion batteries). Therefore, by adequately considering the challenges to both demand and supply, investors can better-predict the longevity of the lithium boom and better-identify which stocks to back and which stocks to avoid. Lithium demand is currently being driven by the rapid expansion of battery manufacturers as they scramble to meet the surging needs of automakers. In 2016, global EV sales rose by about 60% and the number of these vehicles on the road passed 2 million. Although the rising production data is impressive, it is the expansionary statements being made by the major automakers that have generated the most interest. For instance, Volvo will only produce electric and hybrid vehicles from 2019, VW is targeting 1 million EV sales by 2025 and Bloomberg estimates that over 120 EV models will be available by 2020. Adding oxygen to the EV fire are recent government policy statements in Europe and China for setting timelines to eliminate the use of combustion engines in vehicles. And if that is not enough excitement, discussion has recently flourished on the use of large banks of lithium-ion batteries to store energy for renewable electricity sources, such as wind and solar. This application would enable renewable electricity sources to provide a more reliable and continuous energy supply to national power grids. The two main sources of lithium production are saline desert brines (known as salars) and hardrock deposits that contain the mineral spodumene. 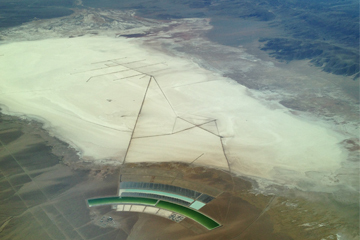 Brine production generally involves large low-cost operations that can generate high-quality lithium products for sale directly to battery manufacturers. The ability to produce battery-grade lithium products means the brine operators can deal directly with manufacturers and achieve premium prices. However, brine operations are generally located in very remote regions, such as the Atacama Plateau, and the complexity of the processing plants means the start-up capex is very high (generally more than US$500m), construction takes several years and commissioning even longer. In addition, the marked variations in brine chemistry within and between salars makes it very difficult to transfer technical knowledge from one operation to the next. Therefore, new supply from salars will be slow to reach the market and requires financial supporters with very deep pockets. Hard-rock deposits containing the mineral spodumene are a rapidly growing source of lithium. The spodumene crystals occur in a hard white rock called pegmatite, which is mined and processed to produce a concentrate of the lithium-bearing mineral. Spodumene mines can get into production much quicker than brine operations and with much lower up-front capital requirements (generally less than US$200m), but the geological complexities of pegmatites will provide future producers a variety of challenges. Geologists have long known that pegmatites are among the most complex mineralogical systems on Earth. Therefore, the size shape and abundance of the numerous minerals comprising a lithium-rich pegmatite can vary markedly within and between pegmatites. For future producers, this variability brings with it potential risks, because each processing plant must cater for the unique characteristics of the pegmatite being mined. But, there is still another potential challenge for hard-rock operations that the market has not considered and which could cause further problems for the supply of battery-grade lithium products into the market. Spodumene concentrates are an intermediate product that must be further processed in a large and sophisticated plant, called a converter. New converters are being built to meet the rising production of spodumene concentrate (e.g., Tianqi Lithium’s convertor at Kwinana, WA), but most of these plants are currently in China. One obvious challenge for future producers is to find a converter with the capacity to accept their concentrate. However, another potential challenge that could soon emerge is how the converters perform when processing the new sources of spodumene concentrates with slightly different compositional characteristics to the material used in the past. Prior to 2017, the majority of global spodumene production came from the world-class Greenbushes mine in southwestern Western Australia. Therefore, the large convertors were designed to accept spodumene concentrate from one particular pegmatite. However, the mineralogical complexity of pegmatites means future spodumene concentrates will be different to the Greenbushes material, so how they perform in the converters is unknown. It is difficult to predict exactly what the problems will be and how much they will impact production, but potentially significant disruptions are likely – as the converters start processing from the new sources. Is it the beginning or the end of the lithium boom? Acorn Capital, believes the demand and supply characteristics for lithium indicate the lithium boom is just beginning. The battery market for electric vehicles will spearhead lithium demand over the coming years and large power-storage units for renewable energy sources, such as solar and wind, will become increasingly important. It is worth noting that the key driver for this upswing in lithium demand is the desire of countries like China to significantly reduce air pollution in their major cities. This is something that benefits everyone in a big city and not just a wealthy minority, so the momentum is sure to continue. On the supply side, the complexities associated with brine and hard-rock lithium operations are well documented, and future projects are unlikely to find it any easier as they develop deposits with different characteristics (and thus different problems) to their predecessors. Moreover, some companies are proposing the use of new technologies to extract lithium, such as Global Geosciences with their lithium-clay project in Nevada and Rio Tinto with their jadarite project in Serbia, which will bring a new wave of challenges and uncertainty. None of these challenges will be fatal for the supply of lithium to the battery market, but will simply retard its supply into the market. Acorn Capital’s preceding analysis of controls on supply and demand for lithium has important implications for stock selection in this growing sector. Because the main driver for growth in lithium demand will be for battery-grade material, it is crucial that investors focus on stocks that can deliver into this part of the market. Therefore, caution must be exercised when considering a project that requires the application of new processing technologies because of their elevated risk for producing low-quality lithium products. For conventional projects (i.e., brine or hard-rock), it is important to consider the range of factors that affect product quality as much as operational costs. For instance, in hard-rock projects it is important to understand the mineralogy of the lithium-bearing minerals in a pegmatite. Different minerals have different physical and chemical properties, which affect the grade and composition of the concentrates. Similarly, for salars it is important to understand the size chemistry and geology of the brine systems. This is because large brine operations need large brine systems to be viable, hydrogeology is crucial for extraction rates and deleterious elements like magnesium are very difficult and very expensive to remove. Acorn Capital has been investing in the lithium sector for over 6 years and have visited many of the key projects. Therefore, all these factors are considered before investing in this exciting and growing sector.